A big part of what makes a bachelor party successful are the cigars. As someone who has been fortunate enough to be at a couple different bachelor parties myself, you will absolutely regret it if you forget them. If you are someone who doesn’t know much about cigars, or the for that matter, you aren’t sure of the best cigars to bring to a bachelor party, then you’ve found the right place. Our guide will start off with answering a couple of questions about cigars and bachelor parties and then we round it out with our top picks for the best bachelor party cigar to bring on your trip. The truth is, cigars aren’t always a great idea to bring to a bachelor party. If you are going to be spending most of your time indoors, or a lot of the guests don’t smoke, then you may want to pass. However, what I can tell you is that there isn’t a much better feeling than lighting up some cigars with some of your closest friends and reminiscing about the good old days. You would be surprised how many people are willing to give cigars a try for the special occasion. Cigars around the campfire, on the boat, or even just around the patio, can stir up memorable conversations that will last a lifetime. 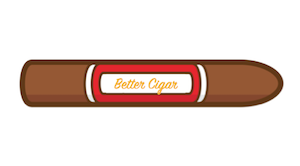 If you are on the fence about whether or not to purchase cigars for a bachelor party, it’s important to first ask yourself if your bachelor party destination will be cigar friendly. 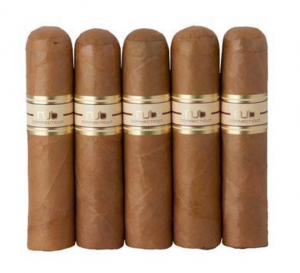 If your group is planning to go golfing or has a poker night planned, then it would be perfect to bring some cigars. However, if your group is planning to go hiking or physical activity is planned for most of the trip, you may not have as much downtime to light up a few stogies. 1. It’s important to remember that the cigars you buy for the bachelor party need to be friendly enough for beginners. Stay away from cigars with a higher nicotine content. A more mild cigar generally goes over better for beginners as well. The last thing that you’d want would be one of your buddies getting a bout of nicotine sickness. I would recommend going with a Connecticut wrapper if possible. 2. Go with a smaller vitola of cigar, which means, a shorter shape/length cigar. If you know that your schedule will be jam packed, sometimes it’s better to go for a shorter smoke that will only last an hour or so. I would recommend going for a Corona or Robusto vitola. 3. Bring enough cigars for everyone to have at least one. Better yet, if your group isn’t too large, bring 50% more than 1 cigar per person. For example, if you have 6 people going, pack away 9 cigars for the trip. That way a good number of the group can have a second cigar if needed. 4. There’s no need to bring all the cigars for the entire trip unless you are staying somewhere remote, like in the mountains. Check online ahead of time and see if there is a reputable brick and mortar to replenish your cigar stash. 5. Don’t break the bank – chances are that you will be sharing these cigars with many cigar beginners who haven’t developed much a palate. Therefore, they aren’t going to fully appreciate cigars that will cost you an arm and a leg. Grab a cigar from the list below and they will be sure to enjoy it just as much without emptying your wallet. 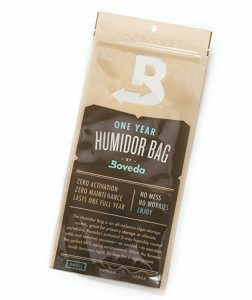 Most brick and mortar shops will provide a Boveda pack and a ziplock for your cigars that should keep them fresh for a few days. However, if you order online, or need your cigars to last longer, it may be worth grabbing a Boveda travel kit. Additionally, you definitely want to remember to bring a cigar cutter and a lighter to be safe. We have a very extensive guide on picking the best cigar cut and cutter. 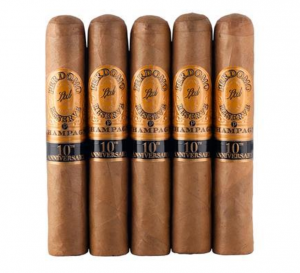 Rich creamy smoke that is friendly enough for beginners but also appreciated by cigar aficionados. 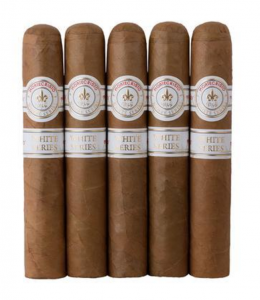 The Montecristo White Series is a cigar that I’ve personally been given at a bachelor party so I can vet it myself as a top notch bachelor party cigar. Oliva is a name that you’ll find in nearly every brick and mortar cigar shop. They are popular for a reason – with a nutty and peppery spice that is good for any occasion. This is a crowd favorite and frequently recommended across cigar forums to beginners who are trying cigars for the first time. I can’t tell you how many times I’ve seen this mentioned as a good recommendation for a mild smoke. You know a cigar is good when it’s vetted by the majority of cigar smokers over in the cigar subreddit on Reddit! 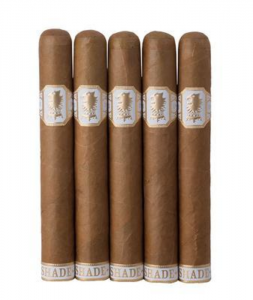 In terms of quality, the Undercrown Shade from Drew Estate is in a league of it’s own. Silky smooth creamy smoke – I’m talking a lot of smoke. Drew Estate cigars are known for their smoke output – making this one of our favorite picks. This cigar would be perfect for the golf course!